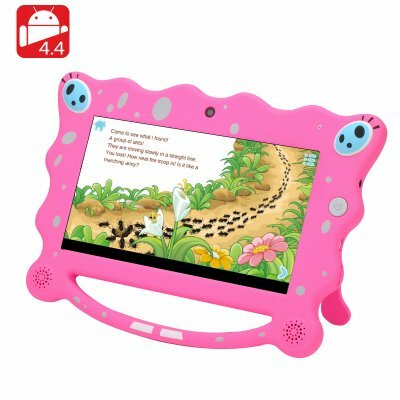 Successfully Added 7 Inch Android Kids Tablet - 1024x600 HD Screen, 4GB, Android 4.4, Quad Core CPU, Wi-Fi, Two Cameras to your Shopping Cart. The 7 inch Android kids tablet is a great gift for your child. It can be a tool for entertainment as well as education. It’s fun, easy-to-use and safe. This tablet comes with a friendly Android 4.4 interface, 4GB of internal space, a nice display, Wi-Fi connection and two cameras. A great gift or any age, the Android 4.4 tablet can be fun and inspire your children to learn all at once. It comes with a nice 7 inch HD screen and will be great for watching movies, educational videos, cartoons and more. Android 4.4 will provide access to the Play Store - where you can find lots of learning apps and gamed to download on the device. The tablet comes with 4GB of internal space. If that is not enough, you can expand the storage space with a micro SD card (up to 32GB). With a 2500mAh battery, the tablet will offer 4 hours of continuous talk time and about 24 hours on standby. The quad core processor will back up all the needed functionality, ensuring quick operation and smooth multitasking. With two cameras, your child will be able to take first steps into photography and snap quick shots of the beautiful things around. With great features, compact design and a friendly, easy-to-use interface, this 7 inch tablet is a great interactive toy and would make the perfect gift. The 7 Inch Android Kids Tablet comes with a 12 months warranty, brought to you by the leader in electronic devices as well as wholesale kids tablets..